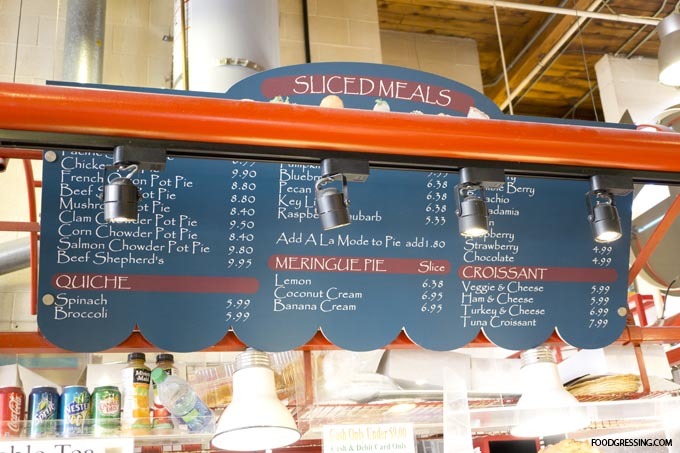 At À La Mode on Granville Island, it’s all about pies. 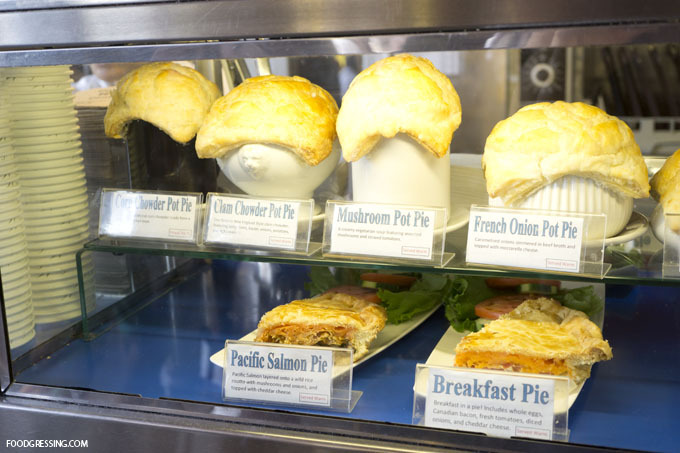 Available in both savoury and sweet options, À La Mode’s display case will put you in the mood for some pie. À La Mode is located inside the Granville Island Public Market and you will typically see a line formed in front of it. The service is fast so the line moves quickly. 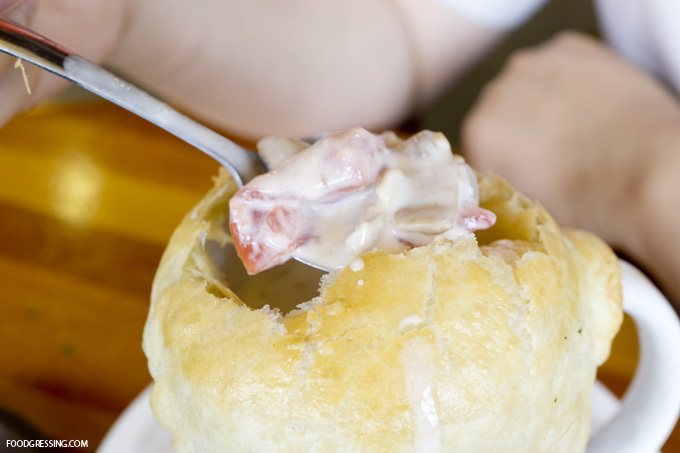 The savoury pot pies are in a warmer and ready to be served. There is a dining area where À La Mode is located has a beautiful view of False Creek and has varying sized dining tables and counter tops. The area receives lots of people so be prepared to have to wait for a table. It may also be courteous to leave right away after you are done as there are probably others waiting for a seat. There are also dining tables and seating areas outside of the Public Market. 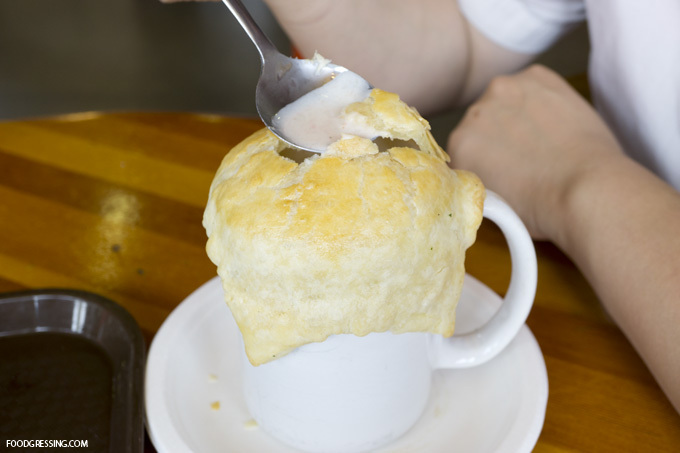 The À La Mode pot pies will tempt you with their deliciously-looking puff pastry crust over top of a mug, bowl or ramekin. 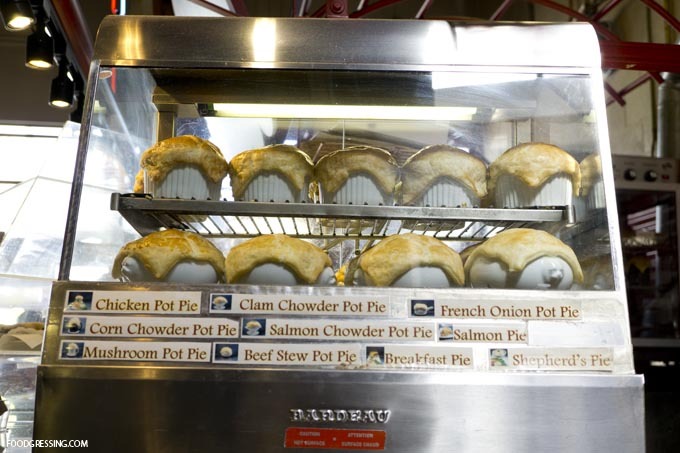 Some of their savoury pies include salmon chowder, french onion, beef stew and mushroom. 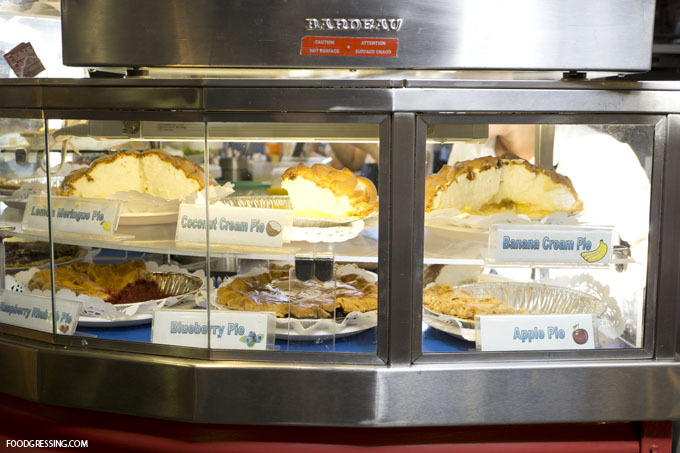 There are sweet options as well like coconut cream, lemon meringue, and banana cream. 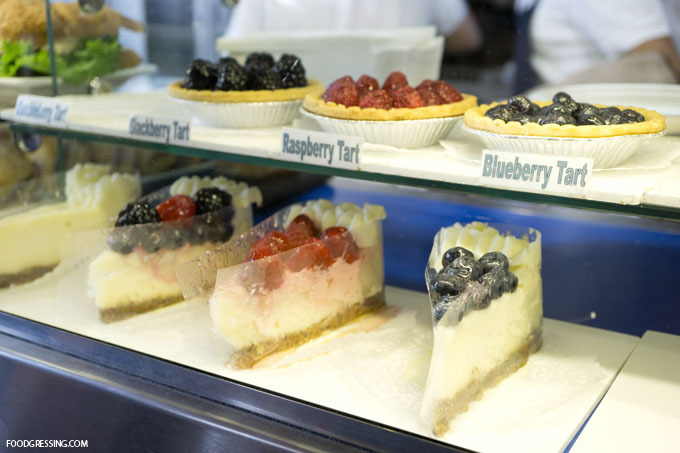 They also have a selection of delectable tarts including blackberry, raspberry and blueberry flavours. 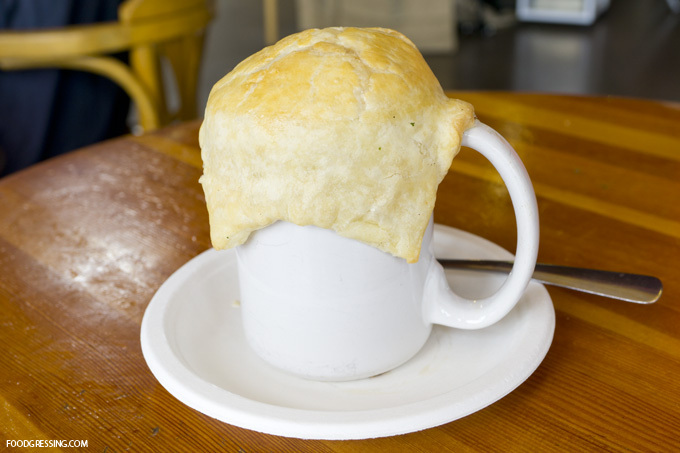 I tried À La Mode for the first time last week and ordered a classic clam chowder pot pie. 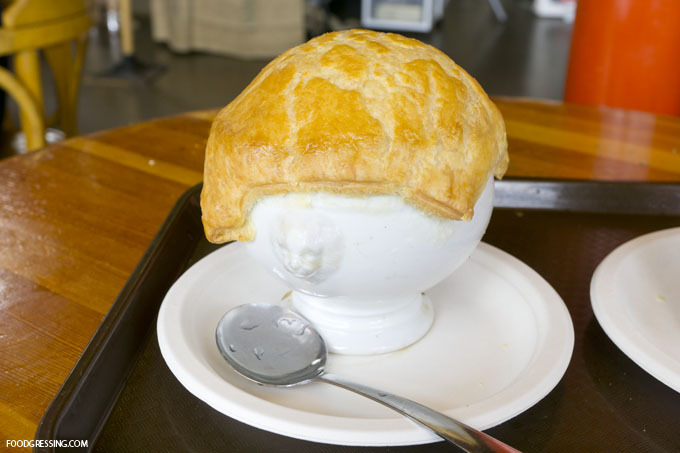 The appearance of the pot pie was impressive to me and I expected it to have decent portions. After I eagerly dug into the crust, I was a bit disappointed to find that the crust was thin to go with the amount of soup. The crust was buttery, flaky and delicious. The chowder had a nice flavour but seemed a bit too watery. My husband’s mushroom and tomato pot pie came in a tall mug. It was flavourful but had the same issues: a thinner than expected crust and soup. For more of my Granville Island eats, follow the tag Granville Island. A few years ago, my husband and I traveled along the east coast of Australia from Cairns down to Sydney. Aside from trying a kangaroo steak for the first time, my most memorable food experience was indulging in Australian meat pies. I tried many pies from the Pie Face chain as well as some from smaller local shops. The pies were so good and baked to perfection: delicious fillings, flavoursome gravy in a flaky buttery crust. I miss those mouthwatering pies, but here in Vancouver, I get to relive a bit of the Australian pie experience through Aussie Pie Guy. It has been a few years since I visited Whistler. 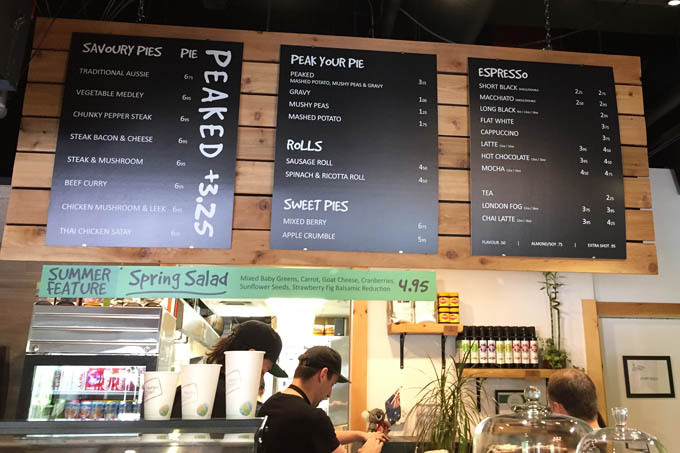 While I was researching places to eat in Whistler for my recent visit, I learned of a new pie shop that opened called Peaked Pies. They have been open for two years and they serve amazing Australian meat pies from what I read. I was excited to try out their offerings and made it my first food stop when I arrived in Whistler. Peaked Pies is a small shop that is located just on the far side of the Whistler Village. For those who are familiar with Crepe Montagne, Peaked Pies is across it. There are a few dining tables inside, a counter with stools, and two tables outside. 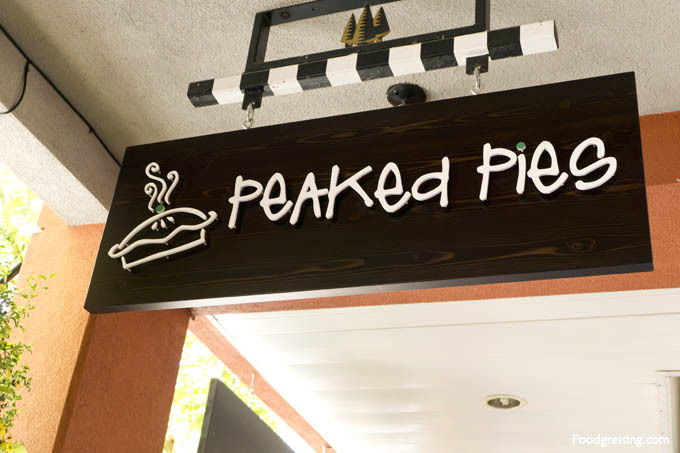 Peaked Pies has eight savoury pie options for around $7, including traditional Aussie and steak and mushroom. 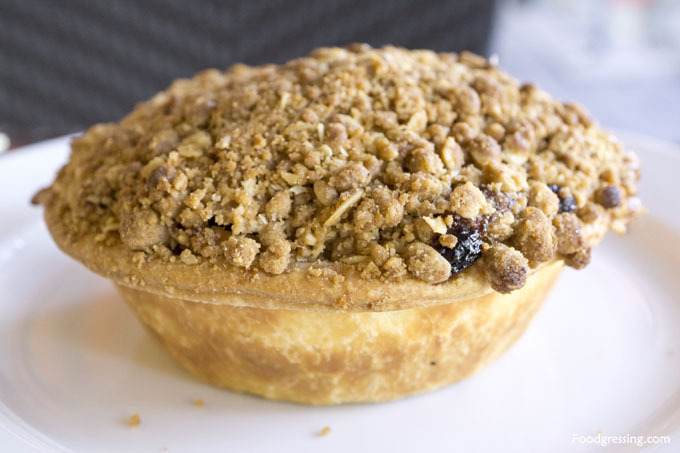 Sweet pies are $6-$7 and include mixed berry and apple crumble. If you don’t fancy a pie, you can get a sausage roll or a spinach and ricotta roll ($4.50). 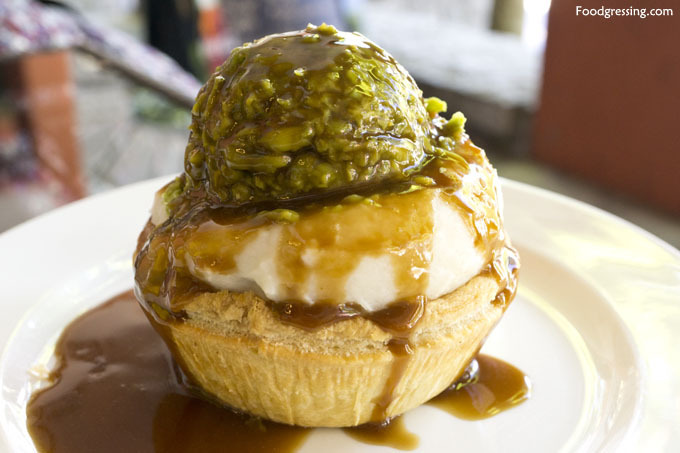 The best part of Peaked Pies is the option to “peak” your pie with a heap of mashed potato, mushy peas and gravy ($3.25). You can also “peak” the pie in moderation for $1-$2. We tried the traditional Aussie pie ($7) with a peak (+$3.25). The presentation of the peaked pie was just mouthwatering. The pie was hot and hearty with yummy gravy from the peak and from the filling inside. The portion of ground beef on the inside was reasonable as well. The crust was deliciously flaky and buttery. The pie was filling between two people as we were not too hungry at the time. The next morning, we had one of their breakfast pies called “Rise and Shine ” ($5.95). It had egg, bacon, green bell pepper, fine minced onion, cheddar and potatoes. I think it was the perfect breakfast pie to start the day because it did not feel heavy. The top of the pie had a nice crunchy texture. The sweet pie that we tried was the apple crumble, which had sweet warm apples with a delicious golden crust. It had just the right amount of sweetness and was a wonderful dessert option. 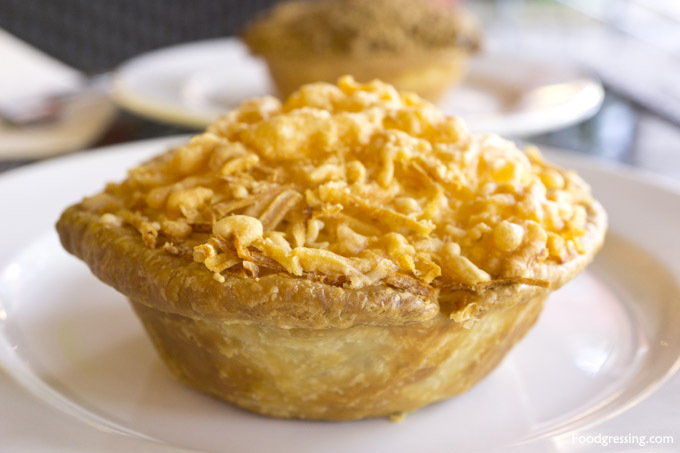 Peaked Pies also has frozen pies that you can buy, but only in the savoury varieties. 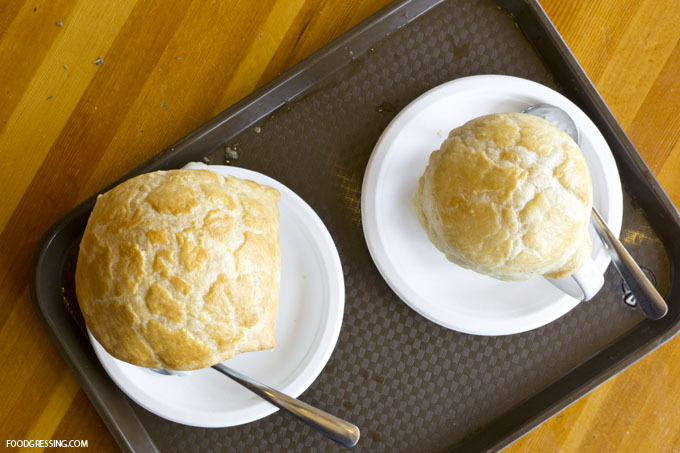 The food at Peaked Pie was very hearty and it made me feel good! The quality, taste and portions of the pies were excellent. 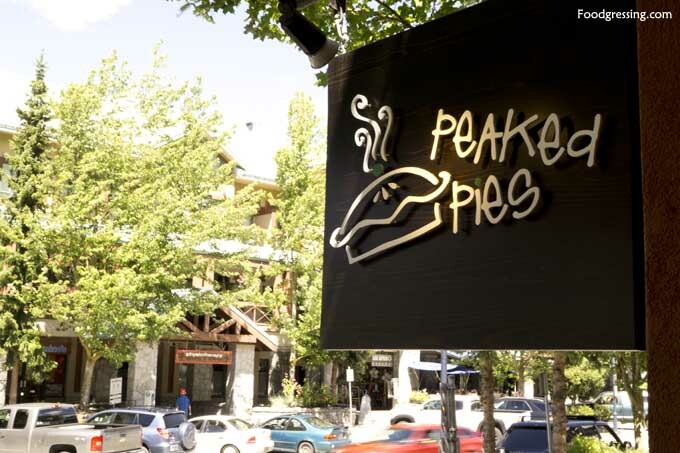 The peaked pie is a definite must-try in Whistler unless you are on a diet. It is hard to say no to mashed potatoes, peas and gravy topped on a delicious pie. There was a lot of mouthwatering on my part and I look forward to going back to Peak Pies!